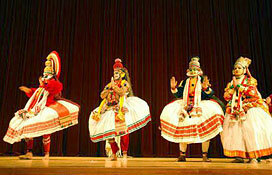 Indian dance-drama form from Kerala in SW India. Its name derives from the same words as kathak (see above) but it is far more vividly theatrical in style. The stories in its repertory are taken from the ancient Indian epics Ramayana and Mahabharata as well as from folk tales. Its dancer-actors (who are traditionally male, due to the strenuousness of performances) employ vigorous, highly stylized gestures to reflect the words sung by the musicians standing behind them as well as to evoke the atmosphere and setting of each scene. Costumes and head-dresses are very elaborate and the make-up (which can take four hours to apply) reflects the nature of the various larger-than-life characters with different colors depicting good, evil, male, or female qualities. Performances often begin at dusk and may last for sixteen hours. Ayurveda is the oldest healing science in the world. Ayurveda literally means Science of Life, or Science of Longevity. 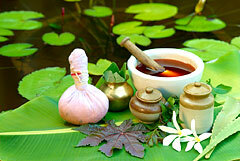 Ayurveda provides treatments for physical and psychological ailments. These include herbal medicines, massages, oil treatments and body cleansing. The treatments are all-natural, and have no side effects. Further, because Ayurveda treats the root cause of the illness rather than the symptoms, it provides lasting effects rather than temporary relief. AYURYOG website features principles of Ayurveda, Panchakarma, Kerala Ayurvedic treatments, facilities in Kerala, medicated oils and herbs; and articles on various ailments that can be effectively treated with Ayurveda.